Our very own Kaitlyn shares the benefits to her dog Max 's health once she switched to feeding a raw diet. From healthier teeth and coat, there are many benefits to your pet's health. When I first started working with dogs I had no idea about health and nutrition. I went with exactly what the vet said and just assumed that it was the only option and that they knew the best for every dog. It wasn’t until I started working at a small family-owned dog kennel that I first found out and learned about feeding a raw diet. Once I started learning about the benefits of feeding raw, I was sold. 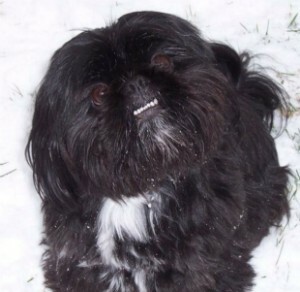 At this time I had a small Shih Tzu mix “Max” who had developed a severe infection that caused flaky dry skin, hair loss, sores covering his entire body, and horrible teeth. We had taken him to see at least three different vets and all of them were very unsure what the cause was. We tried all sorts of different diets and medications for over three years with no good results. We felt as if there was never going to be a solution. That’s when I learned about raw being an answer to Max’s issues. One benefit that I feel most people are not aware of is how great a raw diet is for pet’s teeth. Dogs and cats were not designed to eat a carbohydrate-based diet, and kibble is very hard on not only your pet's teeth but all parts of their body. They are not designed to process all the carbohydrates and fillers that are added to your traditional kibble diet to keep it together. Dogs teeth were designed to rip apart meat and chomp on bone. Small dogs, in particular, are already known to have a lot of issues with their teeth decaying incredibly fast. When you feed them carbohydrate-filled food, you are only adding to the problem. This is mainly caused from dogs not producing amylase, which is an enzyme that starts the digestion process in the mouth. Dogs get amylase from food, but when the food is cooked and so heavily processed the enzymes are destroyed. Without amylase the food particles then stick to the teeth and cause a buildup of plaque, which leads to a buildup of bacteria which can give your pet terrible breath and rot away their teeth. Kibble was made for convenience, not for the heath of dog and cats. It was a way to use leftover, poor quality ingredients that were not good enough for humans to eat. Feeding raw can keep the teeth white and tarter free, keeping the breath from smelling. Another benefit I find to be really great when feeding your pet a raw diet is how much it helps the skin and coat. Raw meat provides a source of essential amino acids, fatty acids, live enzymes and tons of other healthy essential ingredients that benefit the skin and coat. When you feed a raw diet, the skin is less oily and greasy which leads to a softer, shinier, smoother coat. Having a healthier coat leads to less shedding and dandruff, which in turn can help with allergies. Raw fed dogs tend to smell less and feel cleaner because of the healthier skin and coat so bathing is very minimal. Most of the time skin and coat issues stem from the way the pet’s body is digesting food. Everything that goes in the body has to make its way out somehow. When the body is given food that it was not designed to digest, it does what is necessary to get it out. The skin and coat are usually one of the main ways the body rids it. When you only put good in, being raw, you get amazing results on the outside. Transitioning Max to raw was the first time in over three years that we saw any sort of relief for him. He went from being completely covered in sores and having dry flaky skin, to the sores slowly disappearing and the skin being less flaky. His coat got thicker and his hair was shinier than it had ever been. After over three years of trying so many options, it was amazing that all he needed was a new diet that his body could actually digest. There are so many more benefits to feeding a raw diet. Teeth and skin are just a start as to how it can change your dog or cat’s life. Feeding a raw diet might seem overwhelming or even difficult at first, but once you look at how many benefits it can have for your pet it makes it all worth it.